Introduction The inhalative administration of drugs is a non-invasive application form that is regularly used in the treatment of ventilated patients in critical care setting. However, assessment of effectiveness or distribution of nebulised drugs is one of the lacking cornerstones of modern intensive care monitoring. Electrical impedance tomography (EIT) may provide a promising new monitoring and guiding tool for an adequate optimisation of mechanical ventilation in critically ill patients. EIT may assist in defining mechanical ventilation settings, assess distribution of tidal volume and evaluate associated pathologies at bedside. This study aims to elucidate the extent to which the effectiveness of inhaled salbutamol can be increased by the additional use of EIT for optimisation of respirator settings. Methods and analysis This study is a randomised, open-label, superiority trial conducted on an intensive care unit of a German university hospital, comparing two groups of mechanically ventilated patients with an acute or chronic bronchial airway obstruction according to the effectiveness of inhaled salbutamol with (intervention) or without (control) additional use of EIT for optimising ventilator settings. The primary outcome is change in airway resistance 30 min after salbutamol inhalation. Ethics and dissemination The study has received approval from the Ethics Committee of the Medical Faculty of Ruhr-University Bochum (17-6306). The results will be made available to critical care survivors, their caregivers, the funders, the critical care societies and other researchers by publication in a peer-reviewed journal. Trial registration number DRKS00014706; Pre-results. This is the first interventional trial assessing whether the additional usage of electrical impedance tomography (EIT) can improve the effectiveness of inhalative drug administration in critically ill and ventilated patients. EIT could help to visualise and verify an effective nebulisation that could provide a safe, efficient and individualised way of inhalative drug application, for example, by increasing the effective dose for reaching the distal airway. Despite few possible limitations of EIT, this device can provide a remarkable advance in the field of individualised and guided mechanical ventilation adjustments at bedside. The secondary outcomes of this study will possibly offer opportunity to recommend standard respirator settings for inhalative drug application. The lack of blinding of the assessors collecting data on EIT usage is a limitation to the study design. Based on this issue, our study aims to elucidate the extent to which the effectiveness of inhaled drugs, for example, β2 sympathomimetics, can be optimised by the additional use of EIT for adjusting ventilator settings. Accordingly, we want to test the hypothesis on whether EIT can increase the effectiveness of inhaled salbutamol. This study is a randomised, open-label, superiority trial comparing an interventional group with optimisation of respirator settings under the use of EIT and a control group without optimisation of respirator settings. Ventilation distribution images will be obtained with a commercially available EIT system (PulmoVista, Dräger Medical, Lübeck, Germany). All patients admitted to the intensive care unit (ICU) of University Hospital Knappschaftskrankenhaus Bochum will be recruited from June 2018 to June 2019. We will perform EIT measurements with PulmoVista (Dräger Medical) and a size-adjusted chest belt with 16 electrodes. The diagnosis of acute or chronic airway obstruction will include clinical examination and expiration flow analysis. Patients aged 18 years or older diagnosed with an acute airway obstruction or known chronic obstructive pulmonary disease under mechanical ventilation for less than 48 hours and providing written informed consent or a positive vote of an independent consultant are eligible for inclusion. Exclusion criteria are pregnancy or lactation, severe obesity (body mass index [BMI] >35), missing medical indication and/or contraindication for inhaled salbutamol administration, Horowitz index ≥400, prior phase of long-term ventilation >14 days, a study-independent medical indication for salbutamol nebulisation in obstructive pulmonary disease and/or an acute obstructive condition, and in the process of withdrawing life-sustaining therapy. Furthermore, patients with the following pre-existing conditions and operations will be excluded: patients with chest trauma or surgery (eg, pneumonectomy), pneumonia, acute respiratory distress syndrome with or without extracorporeal membrane oxygenation therapy, neuromuscular diseases, severe cardiac diseases (eg, New York Heart Association III–IV), acute ischaemic events, active implants (eg, pacemakers, implantable cardioverter-defibrillator), or thoracic skin lesions and wound dressings. Patients will be treated generally with a multimodal concept, which includes analgesia and sedation, fluid administration, lung-protective mechanical ventilation, anticoagulation, as well as haemodynamic, antibiotic and diagnostic management as recommended by guidelines, standard operating procedures or evidence-based best practice. Additionally, after pseudonymisation a large body of clinical and demographic data will be entered into a database for later analysis, including pre-existing morbidities, Simplified Acute Physiology Score II, Sepsis-related Organ Failure Assessment score, BMI, necessity for renal replacement therapy, ventilator settings, ratio of arterial oxygen partial pressure to fractional inspired oxygen (Horowitz index), vital parameters, medications and dosage of vasoactive drugs, and blood chemistry values. Patients were not involved in the development of the research question, outcome measures or study design. A total of 80 mechanically ventilated patients will be included in the study, with 40 patients in the intervention group and 40 patients in the control group. With a total cohort size of n=80, a power of >95% (alpha error p=0.05, beta error <0.05) will be reached, referring to the data about the salbutamol treatment effect from a reference work (table 1) by Malliotakis et al 18 and according to our estimation of a clinically meaningful effect size. Calculations from these values ​​indicate that 76 participants (38 per group) are required to achieve a power of 95% with an alpha error of 5%. To compensate a potential insufficiency of our a priori sample size calculation, due to the lack of comparable studies, we will also perform a post-hoc power analysis to evaluate our beta error. Additionally, all results will be presented with an effect size estimation described as standardised mean difference. The total study duration is planned for 18 months. It will take 12 months for recruitment of patients and collection of data, and the last 6 months are scheduled for analysis. For each patient an individual study duration is 1 day. In the control group, 1.75 hours are scheduled per patient. These include study education and randomisation (30 min), data collection before inhalation (30 min), drug nebulisation and inhalation (15 min), and measurements after inhalation (30 min; figure 1). In the interventional group, study explanation and randomisation (30 min), data collection before inhalation (30 min), installation and adjustment of EIT (30 min), optimisation of ventilator settings (15 min), drug nebulisation and inhalation (15 min), and resetting ventilator settings to baseline and measurements 30 min after inhalation add up to a total duration of 2.5 hours (figure 1). Flow chart of interventional procedures on the intervention and control groups with duration of each step and performed measurements. EIT, electrical impedance tomography; ICU, intensive care unit. Block-balanced randomisation, in a 1:1 ratio, will be computer-generated by StatsDirect (StatsDirect, Cambridge, UK) with random block sizes between n=10 and n=20, additionally using random permutations of treatments within each block. Investigators will be blinded to the allocation according to the randomisation list until the study patient has been included. The EIT and control groups undergo an arterial blood gas analysis and corresponding airway measurements to determine baseline parameters before salbutamol inhalation (figure 1; online supplementary materials 1 and 2). Therefore, 1.25 mg/2.5 mL salbutamol (Sultanol, GlaxoSmithKline, Brentford, UK) is applied with a vibrating mesh nebuliser (Solo, Aerogen, Galway, Ireland). In the control group, baseline measurement is followed by ultrasound nebulisation and inhalation with salbutamol for 15 min, following measurements and arterial blood gas analysis 30 min after inhalation (figure 1). In addition, all study-relevant data are documented pseudonymised on the case report form (CRF) to ensure a standardised operating procedure (online supplementary material 2). This CRF will be handed over to the principal investigator immediately after collection of data. The principal investigator keeps the study documents in a study folder not accessible to third parties. In the intervention group, baseline measurements are followed by the standardised set-up and adjustment of EIT, where a belt with 16 integrated electrodes is attached circularly to the thorax (online supplementary material 3). 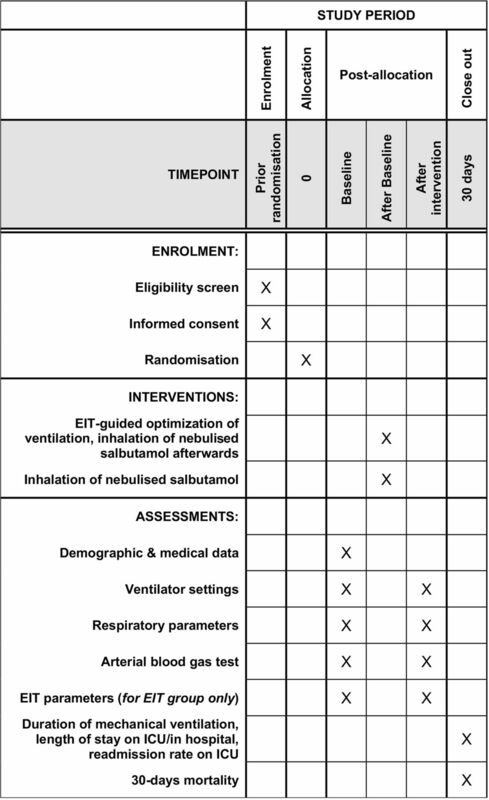 This is followed by the optimisation of the respirator settings by means of EIT using a defined algorithm (figure 2), according the recommendations of the Translational EIT Development Study Group (TREND).5 The EIT algorithm focuses on homogenisation of lung ventilation described by the fast-response parameter region of interest (ROI) to titrate protective positive end-expiratory pressure (PEEP) and tidal volume combinations (figure 2). The next step is nebulisation and inhalation of salbutamol for 15 min. Subsequently, ventilator settings are reset to baseline as before EIT adjustment. After a period of 30 min, a new data collection after salbutamol administration including EIT measurement is done and an arterial blood gas analysis is performed (figure 1). Data are documented on the CRF (online supplementary material 1). 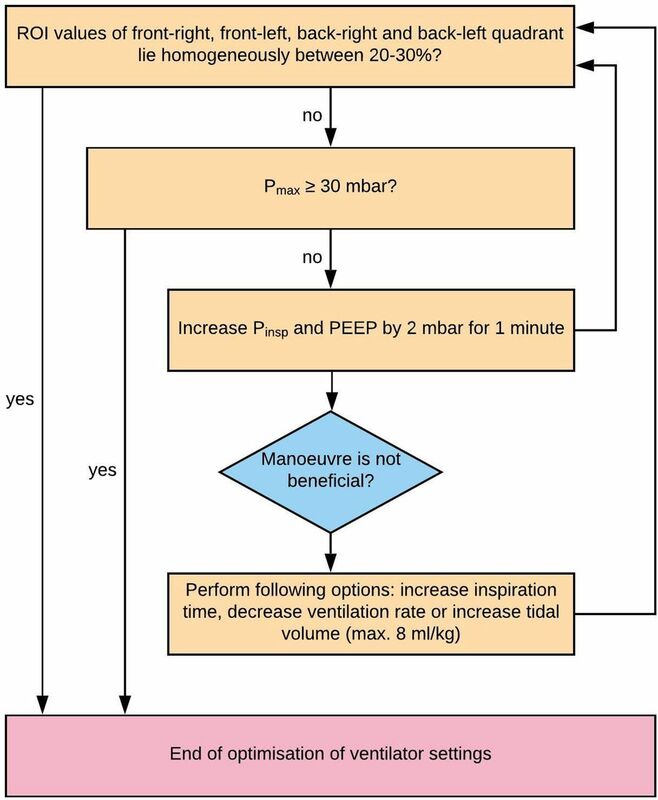 Flow chart of EIT-guided optimisation of ventilator settings. EIT, electrical impedance tomography; PEEP, positive end-expiratory pressure; Pinsp, inspiratory pressure; Pmax, maximum airway pressure; ROI, region of interest. Changes made in ventilator settings under EIT. Tidal volume, compliance, resistance, arterial oxygen partial pressure, Horowitz index, arterial carbon dioxide partial pressure, and peripheral and arterial oxygen saturation. Upper and lower inflection point of the pressure–volume curve. EIT parameters: ROI, changes in end expiratory lung volume (delta-EELV) and changes in end expiratory lung impedance (delta-EELI). Length of stay on ICU and hospital and readmission rate on ICU. The documentation of the data will be pseudonymised and computer-assisted from our patient data management system (Dräger ICM, Dräger Medical) in a central offline database. Therefore, all collected data will solely be provided in pseudonymised form for further study analysis. Access to the pseudonymisation key, which is password-protected, is only available to the principal investigator of this study. All above-mentioned parameters will be collected during the patient’s stay in the hospital until discharge, death or the 30th day of stay on the ICU. In case of discharge from the ICU, follow-up to evaluate 30-day survival will be performed by visit on normal ward or a phone call by one of the investigators. Data entered into the central offline database will be monitored by an independent clinical research associate and checked for consistency and missing values. All records, subjects’ identities and data management will remain confidential with the General Data Protection Regulation of the European Parliament and the Council of the European Union. Furthermore, this protocol was designed following the recommendations for interventional trials (Standard Protocol Items: Recommendations for Interventional Trials; figure 3 and online supplementary material 4). Schedule of enrolment, interventions and assessments: SPIRIT figure. EIT, electrical impedance tomography; ICU, intensive care unit; SPIRIT, Standard Protocol Items: Recommendations for Interventional Trials. 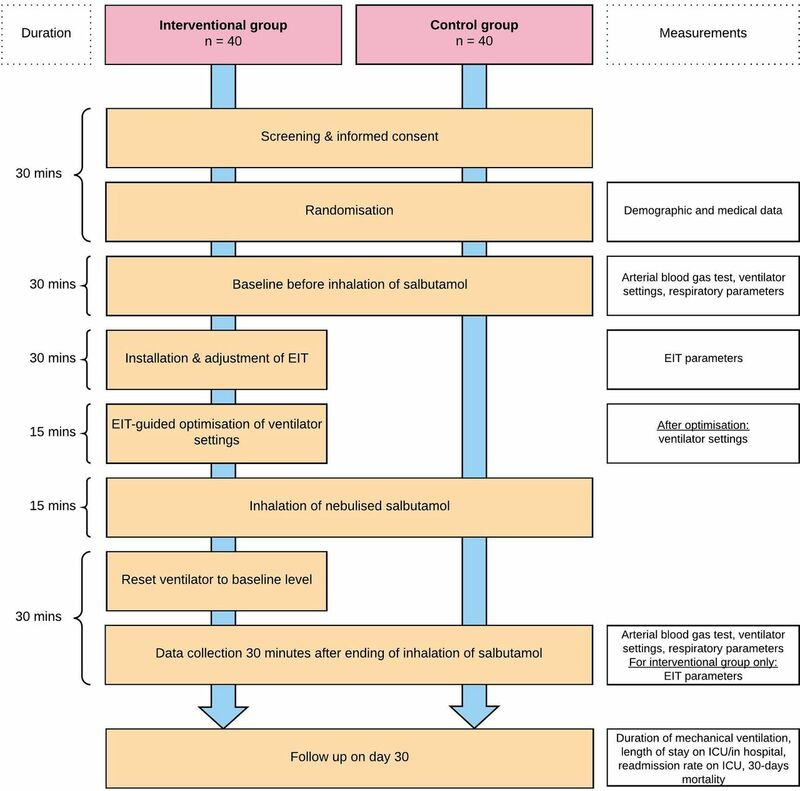 Since this is a study designed to demonstrate superiority of the primary endpoint (change in airway resistance 30 min after salbutamol inhalation), whether an additional use of EIT increases the effectiveness of inhaled salbutamol, we will perform an intention-to-treat and additionally a per-protocol analysis as recommended by the Consolidated Standards of Reporting Trials guidelines.19 The per-protocol population will be defined as randomised patients without major protocol deviations, such as non-considerations of exclusion criteria or missing data for the primary endpoint. Baseline characteristics of all patients will be described per group. Qualitative data will be described as frequencies and percentages. Continuous variables are presented as mean±SD in case of normal distribution and as median and IQR (25th and 75th percentile) in case of non-normally distributed variables. Continuous variables will be compared using parametric Student’s t-test or non-parametric Mann-Whitney U test. Categorical variables will be characterised by numbers with percentages and will be compared using the χ2 test or a Fisher’s exact test. Superiority will be assumed, if the 95% CI for the difference between the means excludes zero or p values are statistically significantly different at an a priori alpha error of less than 0.05. The graphical processing of variables will be performed depending on the measurement level of the variables as histograms, mean value curves with corresponding SD or box whisker plots. A manuscript with the results of the study will be published in a peer-reviewed journal. The study has received approval from the Ethics Committee of the Medical Faculty of Ruhr-University Bochum (17-6306). On completion of the trial and after publication of the primary manuscript, data will be made available in a free accessible online repository. This study, to our knowledge, is the first interventional trial assessing whether the additional usage of EIT can improve the effectiveness of inhalative drug administration in critically ill and ventilated patients. The crucial step forward was the publication of the recommendations of TREND.5 These recommendations highlight the need for a consensus about examinations, consistent terminology and generally accepted approaches to EIT images and analysis. Based on this highly appreciated consensus statement, we are now able to compare, understand and reproduce study findings from among different research groups and provide a standardised use in clinical routine. A further limitation is that EIT captures only ventral to dorsal ventilation distribution. However, Bikker et al 24 also reported a different ventilation distribution between the cranial and caudal lung levels during decremental PEEP trials, concluding that existing EIT systems will not be able to cover the optimal PEEP titration for the whole lung. Despite the possible limitations of EIT, this device can provide a remarkable advance in the field of individualised and guided mechanical ventilation adjustments. Therefore, this study can shed light on the extent to which the additional use of EIT for optimising ventilator settings can increase the effectiveness of inhaled salbutamol. EIT could help to visualise and verify an effective nebulisation that could provide a safe, efficient and individualised way of inhalative drug application, for example, by increasing the effective dose reaching the distal airway. Therefore, these results are also of great interest beyond salbutamol nebulisation, for example, for safe usage of inhalative antibiotics in critically ill and ventilated patients. The first patients were randomised in June 2018. The inclusion of participants is ongoing and is expected to continue until June 2019.
. Regular inhaled salbutamol and asthma control: the TRUST randomised trial. Therapy working group of the National Asthma Task Force and the MRC General Practice Research Framework. Lancet 2000;355:1675–9. Contributors TR: main author of this manuscript, wrote and revised the manuscript. AK: supporting methodical description and participated in the design of this study. GO: supporting data collection, participated in the design of this study and revised the manuscript. MS: supporting data collection, participated in the design of this study and revised the manuscript. MA: supporting data collection, participated in the design of this study and revised the manuscript. HN: supporting data collection, participated in the design of this study, wrote and revised the manuscript. All authors read and approved the final manuscript and the first revision. Funding We acknowledge support by the DFG Open Access Publication Funds of the Ruhr-University Bochum (Ref No IN-1214264) just for financial support for publication costs. This will have no impact on our study design, or collection, analysis and interpretation of our data. Ethics approval This study was reviewed and approved by the Ethics Committee of the Medical Faculty of the Ruhr-Universität Bochum (no 17-6306). It will be conducted in accordance with the Declaration of Helsinki and German laws and regulations. Patients with written informed consent or a positive vote of an independent consultant are eligible for inclusion.